The short answer is that the U.S. State Department wanted them to. Or, more precisely, the Departments of State and Defense did not want to do anything to prevent Soviet boats from fishing off both the Atlantic and Pacific coasts of the United States. Why? Because the cornerstone of American foreign policy after 1945 was open seas and open skies—for American military vessels, merchant marine vessels–and fishing boats. 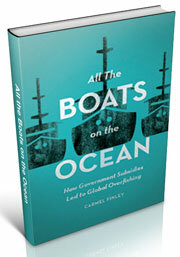 The U.S. wanted to send its military throughout the world’s oceans, unimpeded by regulations as seemingly far-fetched as where a boat could fish. If a country could regulate where boats could fish, that could open the door to other restrictions. But the flip side of this policy was that other nations claimed the same rights, the freedom of the seas to navigate where they wanted, and to fish where they wanted, and to claim those fish resources for themselves. And that’s why Bob Hitz—and Canadian and American fishermen who were off Cape Flattery that September day in 1966—could only stare in amazement at the flotilla of Soviet ships they were seeing. 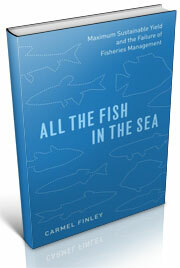 And they could only wonder at the impact of all that fishing might on West Coast fish stocks. “Fisheries are one of the major battlefields in the Cold War,” wrote Washington Senator Warren Magnuson in a nifty little document that Kevin Bailey, senior scientist at Northwest and Alaska Fisheries Center, found when he was cleaning out his desk. 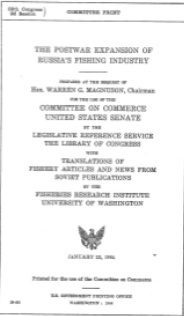 “The Postwar Expansion of Russian’s Fishing Industry,” is the title, and it was prepared by the Fisheries Research Institute at the University of Washington in January, 1964, for the Senate Committee on Commerce. 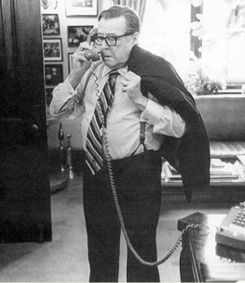 Magnuson was the powerful committee chairman. Soviet fishing almost doubled in a decade and in 1960, the USSR replaced the US as the world’s fourth largest fishing nation, behind Japan, Peru (remember the spectacular collapse of anchovies in the early 1970s) and Communist China. They did it by devoting massive amounts of money at building a new class of fishing boat, the factory processing ship. The prototype was launched in Scotland in 1954; it was called the Fairtry and it made its first trip to the Grand Banks of Newfoundland to fish for cod. (A few years ago, when I was doing research in the British Archives, I found a newspaper clipping about that first fishing trip; the vessel had to come home and install smaller fish gutting machines because the cod were smaller than they had expected. Reading something like that in an archive makes you want to stand up and shout, Look what I found!, but of course you can’t do that in an archive, you have to sit quietly and wish you were a telepath. Fish getting smaller is a powerful indicator that they face too much fishing pressure). 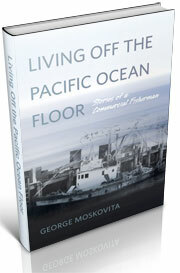 The Pacific story has not been as well examined. And while you might think this is mildly interesting but not too important, scientists are only now starting to understand the biological and oceanographic consequences of the massive removals of fish like Pacific Ocean Perch, which I like to call our poster fish. What role did the eradication of POP off Alaska play in the surging population of pollock, the world’s largest and more economically valuable fishery? The publication of this pamphlet in 1964 played an important role by summarizing the information about Soviet fishing in both the Atlantic and Pacific and issuing a call to arms for both fishermen and citizens that the nation’s fish stocks were at risk by this “prowling and ravenous fishing fleet,” as Magnuson put it. Throughout the 1960s, Magnuson and other coastal legislators led the fight to ban foreign boats in American waters. It took almost two decades for the Senate to pass the Magnuson Fishery Conservation and Management Act in 1976, establishing the Exclusive Economic Zone, or the 200-mile limit. It was done over the opposition of both the State Department and Department of Defense. It didn’t stop the foreign fishing; that’s another story. The Soviet factory processing ships remained, but American boats caught the fish and delivered them to the ships for processing. This is another important West Coast story that has not been told. But the point I want to make today is that when Americans like Bob Hitz saw those Soviet ships, it began the process that led to a chance in the law. The American public had to be informed; Magnuson’s pamphlet played an important role in informing and mobilizing citizens. And it gives me hope that today, if we could just tell the right story in a way that would make people care, maybe we could again change the law. The focus of fisheries management is to estimate harvest; what we need to do, instead, it focus on policies that would maintain and rebuild the population structure of fish like POP. If there are going to be fishermen and fish in the future, we need to repair the damage that industrial fishing did to fish like POP. This entry was posted in Cold War, Environmental History, Fisheries policy, Fishing, History of Science, History of Technology, Marine Policy, Maritime History, Ocean fishing, Overfishing, Pacific Fishing History Project, Rosefish, Sebastes rockfish, Soviet environmental history, Soviet fishing, Soviet history', World History and tagged Fairtry, Pacific Fishery History Project, Pushkin, rosefish, Sebastes, Sebastes rockfish, trawling, University of Washington, warren magnuson. Bookmark the permalink. 2 Responses to So why were those Soviet boats fishing off Washington?